Latin America and the Caribbean is the second-most urbanized region in the planet with 8 out of 10 people living in cities. Between 1950 and 2014, the region urbanized at an unprecedented rate, raising its urban population from 50 to 80 per cent (as per cent of total); a figure that is expected to climb to 86 per cent by 2050. Over the past two decades, the region’s urban population and economic growth has been increasingly taking place in intermediate sized cities, which are expanding exponentially. Emerging cities in Latin America and the Caribbean need planning processes that are specific and action-oriented—capable of bringing about quality of life for citizens in the region. ESC’s Methodology is based on the premise that urban development strategies that are well-planned, integrated, and cross-sectoral, can ensure improvements in the quality of life for citizens and help materialize a more sustainable, resilient, and inclusive future for emerging cities in the region. Stage one: it begins by executing a rapid diagnostic tool to identify the sustainability challenges of a city. Afterwards, topics (i.e. water, air quality, transparency, etc.) are prioritized through the use multiple filters – environmental, economic, public opinion and sector specialist expertise – to identify issues that pose the greatest challenges in a city’s pathway towards sustainability. Finally, an action plan is formulated, containing prioritized interventions and a set of strategies for their execution across the short-, medium- and long-term. 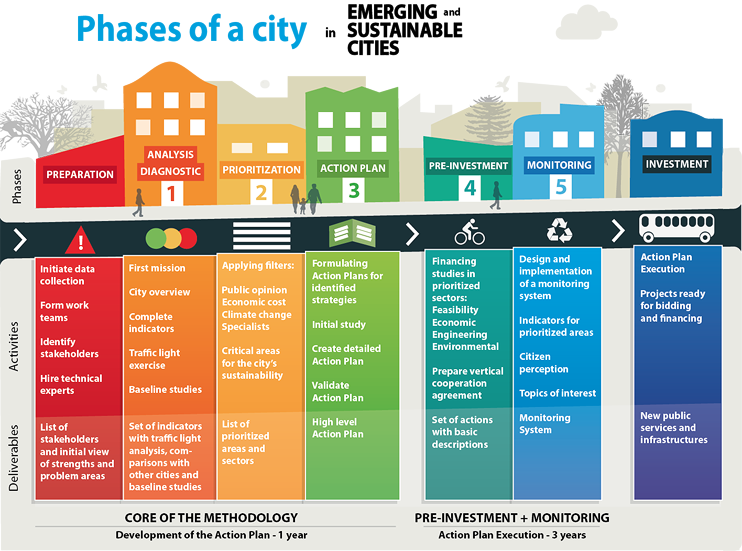 Stage two: the execution phase begins with the preparation of pre-investment studies for prioritized interventions and the implementation of a citizen monitoring system. Do you want to receive personalized information about what we are doing? Register now and receive news in your email according to your interests and preferences.